Zone out of Al Zhabi into Wajaom Woodlands. Navigate thru Wajaom Woodlands to (E-10) where you zone into Aydeewa Subterrane. Keep your left shoulder on the wall all the way to the zone back out to Wajaom Woodlands. The spawn area is at (F-9)/(G-9). In Greek mythology, the Lernaean Hydra was a serpent-like creature which had either 9 heads, 8 heads or an uncountable number of heads. It had the unique power of regenerating any of its heads when they were cut off. It had a poison breath as well and its blood was poisonous and made for potent poison-tipped arrows should arrows be immersed in its blood. The Hydra was slain by Hercules as one of his 12 labors using a sickle and a torch to cauterize the wounds left by removing the heads. 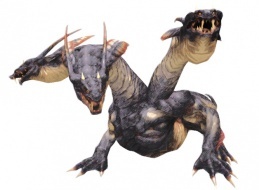 Hydra was one of the offspring of the monstrous Echidna and Typhon. The others were: Cerberus, Ladon, Sphinx, Nemean Lion, Ethon (the eagle that eats Prometheus's liver eternally), and Orthrus (2-headed guard dog). Hera immortalized the fallen monster by placing it in the heavens as a constellation. This page was last edited on 9 October 2017, at 16:19.